Idaho is no longer a "meat and potatoes" type of state: it is becoming a veritable culinary melting pot! New and interesting ethnic restaurants and grocery stores are opening up in cities around the Treasure Valley and a growing group of "new" Idahoans is introducing exciting unfamiliar ingredients, different approaches to old-fashioned foods and secret family recipes that have been handed down from one generation to the next. This blog allows us a peek into the pots and pans of these travelers that have chosen to make Idaho their new home. It captures a compilation of stories and dishes from people who, far away from their country of birth, recreate familiar elements in the dishes they prepare. For many, food from their home country is a comfort to the soul: for some it's an important part of their cultural or religious celebrations and for others, it's just good eating! "This soup is traditionally made with pork, but for my family I choose to make it with turkey breast. It's a healthier choice." Sonia is chopping onions for the soup in her Boise home where she lives with her husband and her son. 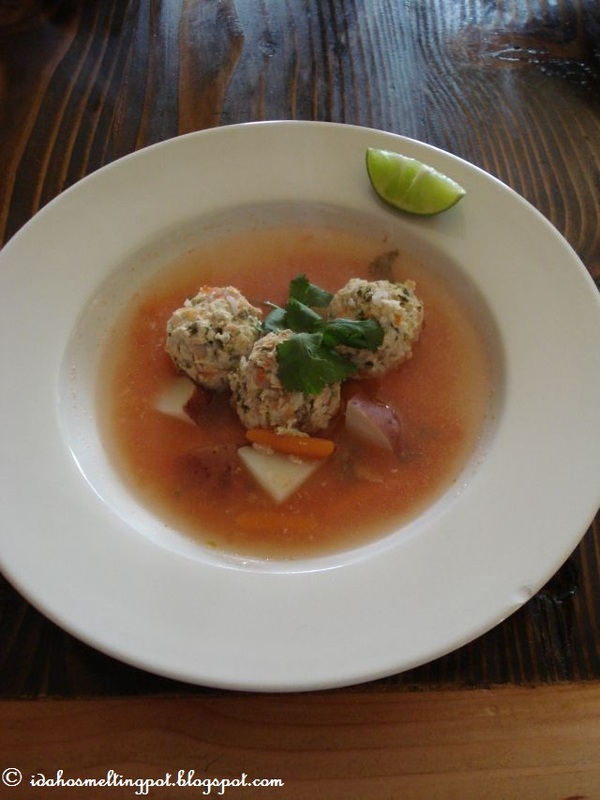 Sopa de albóndigas, or meatball soup, is a traditional Mexican dish. Every Mexican mom has her own version and it can easily be considered the country's favorite 'comfort food'. It is often served for lunch: three or five bite-size meatballs, chunks of potato, carrot and a flavorful broth constitute a full meal, especially served with homemade tortillas. Sonia also uses the same recipe for meatballs in a tomato sauce to serve on a roll or with pasta. Because of the few ingredients in the soup, make sure you get quality produce: each flavor will contribute to the end result. The soup will have an excellent fresh and refreshingly pure taste. 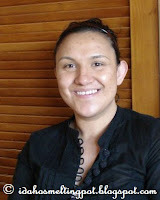 "My mom used to make this soup for us all the time when we were kids," Sonia says, "and now I make it for my own son. He loves it!". 1 medium sized red potato, in bite-size chunks. Mix the turkey breast, egg, garlic, rice, the chopped cilantro and onion until well blended, add a pinch of salt and form into golfball sized meatballs. Bring the water on the stove to a boil, and add the albóndigas one at a time, maintaining a rolling boil. 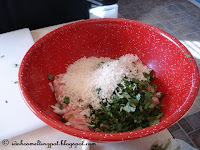 Turn to a simmer, add a couple of sprigs of cilantro to the water for added flavor and boil for ten minutes. Blend the tomatoes into a smooth sauce and bring up to a slow boil on the stove. Now add the potato and the carrots to the soup and stir in the tomato sauce. Simmer for another ten minutes or until the meat is ready (when the rice kernels are puffed up and split open.). Taste the soup and adjust according to taste. Serve garnished with chopped cilantro and a squeeze of lime juice. Who is visiting Idaho's Melting Pot?